Artist renderings of a nano-needle poking a single cell have become the symbol of nanotechnology, surfacing on covers of magazines and books for about a decade but actual nano-needles able to interrogate small cells without causing cellular damage have not become reality until recently. A Drexel University team of engineers, scientists and biologists have developed a carbon nanotube-based device for probing single living cells without damaging them. This technique will allow experts to identify diseases in their early stage and advance drug discovery. The research led by Dr. Yury Gogotsi, professor of materials science and engineering and director of the A.J. Drexel Nanotechnology Institute (DNI) , and Dr. Gary Friedman, professor of electrical engineering, uses the nanotube-based device, known as a cellular endoscope, to evaluate cells about a thousand times smaller than a human hair. 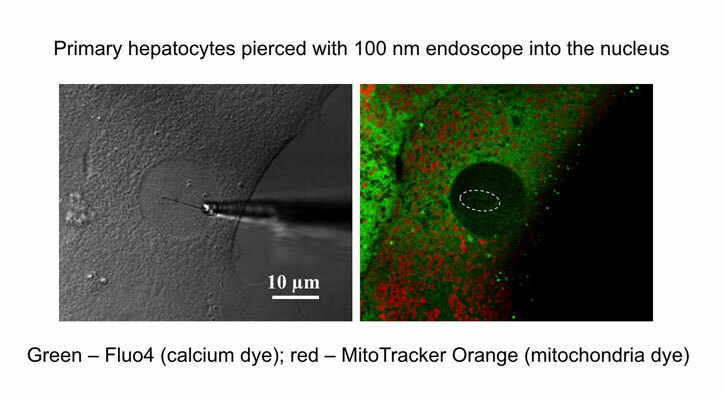 The cellular endoscope interrogates the intracellular environment of living cells, delivers fluorescent quantum dots and analyzes molecules inside a cell without the cell recognizing the needle’s presence. Cell biologists usually destroy a large number of cells to extract cellular components and biological molecules needed for identifying diseases and analyzing effects of new drugs, or to achieve a better understanding of how the cell functions. Glass pipettes are widely used to inject material into cells. The pipettes cause too much damage to remain within the cell for a long time and are not designed to report information in the form of optical or electrical signals from within the cell. “We had an idea for a minimally invasive cellular probe, the tip of which could remain within the cell for a long time while reporting important information in the form of optical and electrical signals and transferring tiny amounts of material to and from the cell. This probe is similar to an endoscope employed by doctors to perform minimally invasive operations inside human patients, only much smaller” said Friedman. 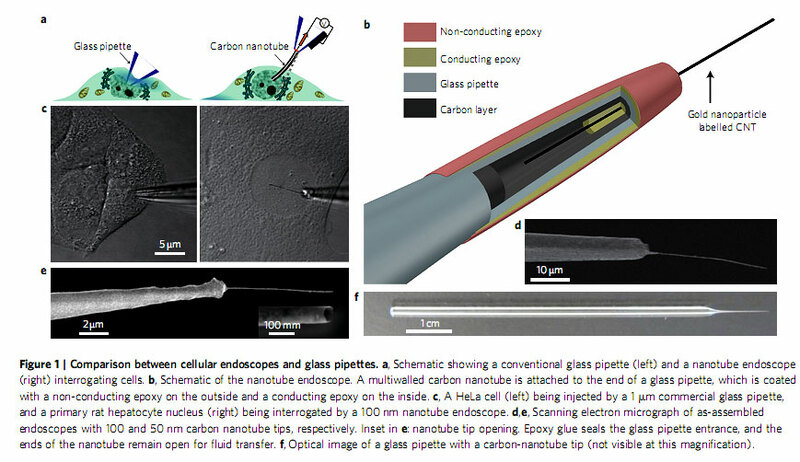 “A cellular endoscope reported here is a novel, but conceptually simple device,” said Riju Singhal, a doctoral candidate and author of the article “Multifunctional carbon-nanotube cellular endoscopes” published in the Nature Nanotechnology journal. “It consists of a single carbon nanotube connected to the tips of larger glass micropipettes that are commonly employed in biological studies, enabling them to become widely used in the near future,” said Singhal. The Drexel team is funded by the Nanoscale Interdisciplinary Research Team National Science Foundation grant and the W. M. Keck Foundation.